These Custom Slot Car Track Cost Whopping $300,000! - Muscle Cars Zone! 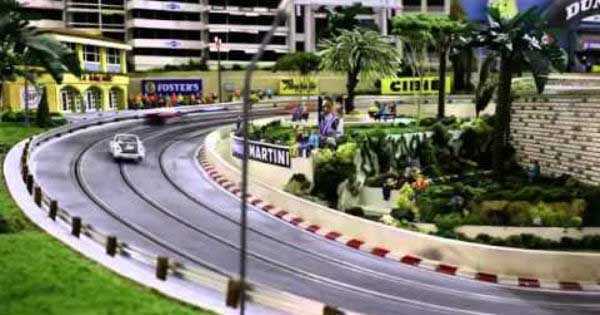 These Custom Slot Car Track Cost Whopping $300,000! We all have a hobby in our life and we love doing whatever is necessary to be done about it; this fulfills us and makes us happy no matter what the cost is and this is the proper reason why we check out this awesome video in which we take a look at custom slot car track that cost amazing $300,000! So instead of purchasing a super car for the same price, you can get yourself this super cool custom slot car stadium and track as well as some custom vehicles. This magnificent piece of art and speed combined together was made by Neiman Marcus and it just might be the perfect gift to give it to someone who is a fanatic about such cars, of course if you have the money to buy one in first place. Slot Mods US actually builds this custom slot car track and it offers much more for the price of $300,000. The guys from Slot Mods US are also capable of making any 1:32 scale model of any car and any track and it does not matter whether they are some of the current ones of some previous tracks. In this build you can find pit crews, various buildings, signs and aluminum Armco railings. There are also tiny cameras mounted on each slot car that gives you a real time video on the small screens at the track. What do you think, is this one of the most hyper realistic custom slot car track ever made? At last, if you are looking for some slot cars, tracks or more, visit this link!